The PC Engines APU2C low-power network computer on my desk, with serial console, the first ethernet port and a USB stick connected. PC Engines has been producing small, low-power systems with AMD CPUs for a long time. Among the great features for building your own router are built-in serial console and multiple quality Ethernet controllers. For a project I selected the apu2c4, a system with three gigabit Ethernet ports and 4 GB of RAM. 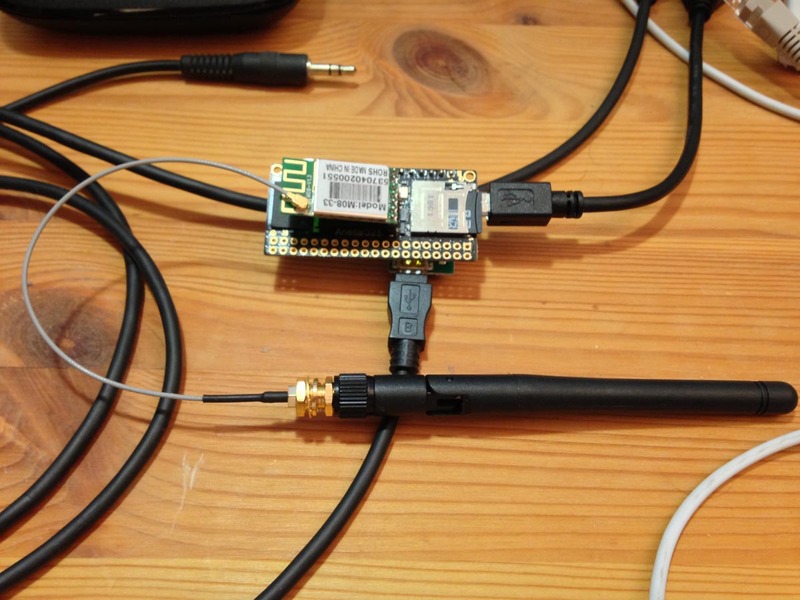 Together with a small M2 SSD module, you have a decently powerful machine to run as a router. In fact, it has enough capacity to run some applications as well, or even small VMs if you’re so inclined! Installing FreeBSD on the APUs is fairly straightforward; however, a small number of gotchas might trip you up. Here’s how I managed to complete the install, and update the APU firmware once I had FreeBSD installed. Download the FreeBSD memstick installer image. I used my closest FreeBSD mirror to download FreeBSD-11.2-RELEASE-amd64-memstick.img. Copy the image to a USB stick that is at least as large as the image; 1 GB should be sufficient. I had trouble when I did the copying on my Mac with the resulting stick not working properly; using a FreeBSD box did the trick for me. 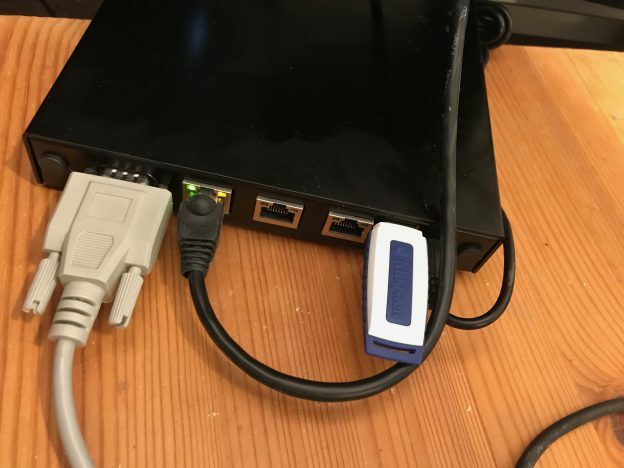 Before booting from the USB stick, mount the UFS partition on a FreeBSD machine. For 11.2, that’s da0s2a; for other releases, it might be different. You can use gpart list to identify the UFS partition to mount. Unmount /mnt and move the stick to the APU. Connect a serial terminal to the APU console port; I usually use an USB dongle and a null modem cable or adapter, and my own simple serial console program or cu(1), using 115200 baud. Make sure to add the console and comconsole_speed variables to /boot/loader.conf on the installed system on the APU as well. Unless you add them, you won’t be able to log in to the console. If you forget to edit /boot/loader.conf, not all is lost: you can change the settings during boot. But because the loader detects both the serial console and a keyboard (although the APU has no support for a keyboard or built-in graphics), it is somewhat cumbersome, as the console output will be screwed up. The APUs use CoreBoot as their BIOS. PC Engines has ready to use CoreBoot images on their own GitHub page. You can update the BIOS using flashrom, a command line tool to program firmware devices across many devices and platforms. Download the correct CoreBoot image for your model of APU from pcengines.github.io, directly to the APU. I picked apu2 v4.8.0.1, which was the newest at the time of this post. coreboot table found at 0xcfde9000. Scanning /dev/mem for entry point. 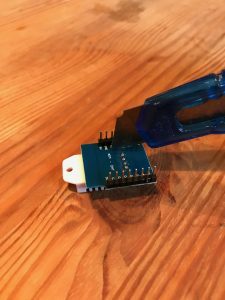 If flashrom complains about the image not matching the mainboard, you need to force the programming as suggested in this forum post. Reboot the APU to activate the new firmware. I tried to update the BIOS using the procedure suggested by PC Engines, using TinyCore, but I had trouble creating a TinyCore USB stick. Luckily I came across this BSD Foren post and realised that I could just use FreeBSD directly. This entry was posted in freebsd, hardware, networking and tagged freebsd, PC Engines on July 8, 2018 by stb. If you use different devices to record video, you might have come across “jittery” playback of some clips: if the project has a frame rate different from the clip you’re adding, iMovie adapts by removing frames, or duplicating them, depending on whether the clip frame rate is higher or lower than the project frame rate. So how does iMovie determine which frame rate to use for a project? It sets the project frame rate when you add the first clip to the project. However, it only does that if you click the plus icon! If you drag the clip from the media browser to the timeline, it keeps it’s default, which for me (in Europe) appears to be 24 frames per second. Since there is no way to change the frame rate after adding the first clip, make sure you drag an appropriate clip in to the time line first thing. The only way I found to check if the correct frame rate has been set is to export the project and check with QuickTime or VLC. This entry was posted in web and tagged iMovie, mac os x, video on June 10, 2018 by stb. At least for the boards I’m using, this confuses the sensor completely, and it will not react to the ESP8266 trying to read data from it. With the Arduino sketch adjusted to use pin D0 instead of D4, the sensor can now be read reliably. p.s. It is possible that this problem is limited to clone boards that use the DHT22 instead of the DHT11. 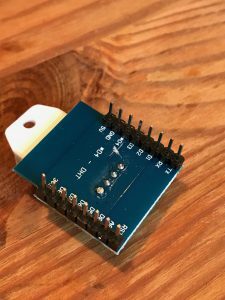 I now see that Wemos has discontinued the V1 version of this board. The current version uses a DHT12 sensor that communicates via I2C. 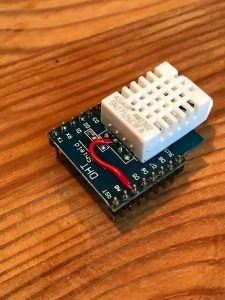 This entry was posted in hardware and tagged arduino, dht22, wemos d1 mini on February 14, 2018 by stb. Home automation seems to be the rage this christmas, with gadgets to control lights, heating and entertainment systems wirelessly, maybe even with only your voice. I’ve been using Logitech’s Harmony Hub for many years now, and are very happy being able to switch on all devices needed and set them to the right channels: the TV, the surround receiver, the TV and an Apple TV, Fire TV or Bluray player, with single button press on a single remote. Harmony Hub isn’t supported by Apple’s HomeKit, but so far, that wasn’t really a concern, since I wasn’t using anything else that would be able to be controlled by HomeKit. But in December, I broke down and got a bunch of Philips Hue lights. Naturally, tying Hue and Harmony together became a challenge. So I started looking around, to find a way to control everything through a single interface. It seems that HomeKit together with homebridge manages to do exactly what I want: offer all devices connected to the Hue hub to HomeKit (through homebridge-hue), and allow me to control the Harmony Hub (through homebridge-harmonyhub). Here’s how I got this all working in FreeBSD. homebridge is a daemon process that mediates between HomeKit, Hue and Harmony. As such, it needs to run permanently. For security reasons, we do not want to run homebridge as root, but as a less privileged user homebridge. To create the user, I used vipw and consulted /usr/ports/GIDs to look for an id in the range below 1000 that is not yet used by any port. Instead of vipw, you can use adduser(1). I gave the user /usr/sbin/nologin as a shell since we’re never going to log in directly as a user. There is no FreeBSD port for homebridge, but the installation is relatively straightforward. The installation instructions for homebridge insist that the NPM must be installed globally; I briefly tried to install locally, but couldn’t get it work. The FreeBSD port for avahi-libdns puts the include file into its own subdirectory (so it won’t conflict with mDNSResponder), but the NPM packages expect it to be in /usr/local/include. The easiest way to fix this is to create the symlink. Since I’m running avahi, I have not investigated how to run homebridge with mDNSResponder. The output from this is important in two ways: homebridge-hue will connect to the Hue bridge, wait for you to press the button to authorise the pairing, and then display the username and token for this connection. You’ll need to copy the output and add it to the users key for the Hue platform entry in the configuration. You will need to restart homebridge for this config change to become effective. Also, the terminal output will show a QR code you can use to connect homebridge as a bridge to HomeKit, using the Home app on your phone or iPad. You can also enter the code manually, in this example the code is 031-45-154. WIth tmux(1) (or screen(1)), you can run a terminal session independent of the current login. You can detach from that session at any time, and it will continue to run; you can also re-attach at a later time. This allows you to start homebridge, observe all the log output, and then detach from the session, keeping it running. If you need to look at the log output, you can reattach. This is most useful while you’re optimising the configuration, or trying out additional plugins. Now the last thing I need to figure out is which Siri commands to use to activate a scene. Then I can switch on the entertainment center and dim the lights with a single voice command! This entry was posted in code, freebsd, networking and tagged Harmony, HomeKit, Hue on December 16, 2017 by stb. I’ve started playing with various incarnations of “in a box” OpenStack setups to familiarize myself with OpenStack, among them DevStack and Ubuntu OpenStack. The OpenStack Chef Repo looks promising to me, as it gives you a good starting point, but can easily be extended to more complex lab setups, or even full productions environments. [2015-08-10T00:02:19+02:00] INFO: Port forwarded: local URL chefzero://localhost:8889 is available to 127.0.0.1 as chefzero://localhost:8889 for the duration of this SSH connection. Chef encountered an error attempting to load the node data for "controller"
gem executables will not run. The next version of ChefDK will likely come with this updated version of chef-provisioning, but until then, this should do the trick. This entry was posted in code and tagged chef, mac os x, openstack, ruby on August 10, 2015 by stb. This weekend, I received my ACME Arietta G25 Atmel ARM board, and tried to get it going with my Mac. I ordered the “plain” version with 128 MB RAM, as well as one with 256MB RAM, as well as Wifi boards and the DPI debug board. After soldering in the necessary posts, I attached the DPI board and verified that my Mac has the right FT232 driver to access the console, no problems here. I then fired up by Ubuntu VirtualBox machine and followed the instructions to build the Micro-SD-Card image. I then proceeded to boot successfully from the card. Through the console, I could get the Wifi card going; since I wanted to have support for more than a single network, I extended the configuration through wpa_supplicant.conf. ACME has configured a Gadget driver to supply an Ethernet interface through the host port on the Arietta; in ACMEs configuration, this is set to offer both RNDIS and CDC EEM modes. Unfortunately, Mac OS X 10.9 doesn’t support either. For Mac compatibility, de-select the RNDIS support and the Ethernet Emulation Model (EEM) support under Ethernet Gadget. After building the kernel and replacing the files on the SD Card, I changed the module load line in /etc/network/interfaces to load the g_cdc module instead of the g_ether module, and added an entry in /etc/inittab for /dev/ttyGS0 to also have a console through the host port. This entry was posted in Linux, networking and tagged Arietta, ARM, atmel, CDC, gadget, kernel, network, usb on June 30, 2014 by stb. Java proxy settings are highly annoying. On Windows and Mac, Java does use the system proxy settings, but it doesn’t necessarily understand the same syntax as say IE or Safari/WebKit for the proxy exceptions. The end result is that you keep guessing why certain services deep inside your huge web application keep failing in mysterious ways. On other platforms, you have to configure the proxy through system properties. Restarting a web application to test out configuration changes can take a long time. While solving the problem might not be easy, at least I can help with debugging it, with a very simple one-liner: Java Proxy Check (GitHub, direct download link). On Mac OS X and Windows, Java uses the system proxy configuration; on other systems, it optionally can use Gnome settings, but by default relies on system properties being set at startup, as documented in Networking Properties, Proxies. This entry was posted in Linux, networking and tagged http, java, proxy on May 28, 2014 by stb. I will upload my Ansible role for this to Github shortly, but I felt it necessary to spare the next person the pain of getting it all to work. To use nsupdate, you need to give bind a key, associate that with a zone, and then use that key with nsupdate. Sounds easy enough, right? What all the tutorials fail to mention is that the key files and the name of the key entries in named.conf are all significant. First, you need to decide what to call your key. It doesn’t matter for which zones you will use it, or from which hosts you will run nsupdate, but you will need to pick a name and stick to it. You can’t change it later, you will need to create a new key if you don’t like the name. This will create two files. You need both of them, and you can’t change the files’ names. It is important to remember that “mysamplekey” needs to be the exact same string as from the key generation! This entry was posted in freebsd, Linux, networking and tagged bind, key, named, named.conf, nsupdate on May 26, 2014 by stb. I immediately tried in Safari, and had no problems downloading one of these shows. So more debugging was necessary. Enabling additional output for Python’s urllib2 (used for downloading the XML table of contents) and curl (used for downloading the media files) showed an unusual Set-cookie response header on all of the requests, setting a new value for the “sid” cookie. Quick recap: when you load the XML TOC over HTTPS, the Tivo sets a “sid” cookie which you need to supply to download the actual show’s file. No problem, my script was recording the cookie using cookielib.CookieJar, passing the resulting file to curl. Or so I thought. Inspecting the cookie jar I found it to be empty. How could that be? So the Tivo is apparently trying to set a persistent cookie (confusingly named “sid” as it’s not a session cookie), but doing so with a date in the past. And everything was working just fine until last Saturday! So either Tivo pushed a software update on Sunday, changing the expires date of that cookie, or it has had that date for ever, and eternity just ran out. I haven’t reverse engineered the firmware, but I would bet that someone way back when Tivo got started hard-coded the date “way in the future”, and everbody promptly forgot about it. No word from Tivo yet, but this Tivo forum thread mentions the same broken cookie. I managed to add a hack to my script that extracts the “sid” from the Set-Cookie header manually and hand the proper cookie value to curl for the downloads. And I got to learn about mechanize for Python! This entry was posted in networking, web and tagged cookie, debugging, download, http, python, tivo on February 20, 2013 by stb. Heute war die Marco Polo der französischen CMA-CGM-Reederei auf ihrer Jungfernfahrt am Burchardkai in Hamburg zu besuch. Das Schiff ist so groß, dass man es praktisch immer sieht, ganz egal, wo man gerade hinguckt. This entry was posted in Schifffahrt on December 12, 2012 by alfred.